Version 2: I made some changes to these rules. The original version can be found here. These rules have always given me a good battle, so the changes were minor. Historical Background: In 1836 Texas was still a part of Mexico. But the Texans revolted against the autocratic rule of President Santa Anna. The most famous battle of the Texas War for Independence occurred at a crumbling old Spanish mission on the outskirts of San Antonio. Davy Crockett reportedly said that the Mexicans would "eat snakes" before they got into the Alamo. Four thousand Mexican soldiers stormed the walls of the Alamo, killing all of the defenders. Among those killed were the legendary Davy Crockett and Jim Bowie. Although this was a defeat for the Texans they won their independence later at the battle of San Jacinto. Shouting, "Remember the Alamo" the Texans routed the Mexican army, captured Santa Anna, and secured their independence. Ten years later Texas joined the United States, an event that helped ignite the Mexican American War. Battle 1: The Mexican commanders focused their attacks on the vulnerable log palisade in the North and a breach in the wall in the South. The Mexican columns approached the walls of the Alamo in perfect discipline, undaunted by cannon fire. As they neared the walls a deadly volley of musket fire met them, and all the columns hesitated. For a moment it looked like the Mexicans might retreat without a real fight. But Santa Anna rode up and urged them forward. Mexicans started breaking through the palisade but they were scattered by a withering fire from the defenders, including a large group of Crockett's Tennessee volunteers. Santa Anna was forced to send in his reserves earlier than he'd planned. The stout defense continued. One column of Mexican infantry managed to force their way through the breach in the wall only to find out it was a trap. Receiving fire from all directions they were forced to retreat. However another column of Mexicans had succeeded in raising their ladders and had gained a foothold on the walls. They held off desperate Texican counterattacks, and soon the Mexicans were on the walls in force. They rapidly cleared the walls with their bayonets and finished off the last of the defenders, including Crockett, in the courtyard. They had won a hard fought victory. Battle 2: In the second battle the Mexicans spread out their attacks. A small column of men attacked the south wall without support, and was shot to pieces. Only a handful of men made it to the walls. In the North accurate cannon fire stopped two Mexican columns, then forced them to retreat. Santa Anna had his hands full trying to rally his reluctant men. Two strong columns succeeded in reaching the East wall where they began the difficult task of scaling the walls in the face of the well armed defenders. It was rough going, but eventually they turned the tide and began sweeping the walls of Texicans. The Mexican reinforcements arrived just in time to revive the attack in the North, and soon the Mexicans were pouring into the Alamo from two directions. Crockett tried to form a new defensive line in the courtyard but he was overrun by Mexican infantry. The last survivors tried to hide on top of the chapel, but there was no escape. It was another narrow victory for the Mexicans. The Armies: I decided to go with 1/72 scale plastic figures for both armies. 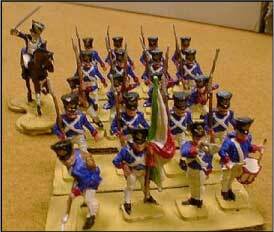 I bought six boxes of Airfix 1/72 scale French Waterloo Infantry. This provided enough figures for 58 bases of four Mexicans, including six command bases with a flag and drummer, and a mounted figure for Santa Anna (with a few leftovers). The Airfix figures are really lousy. Imex has now come out with a set of Mexican infantry. When they were finished the Mexicans were mounted on pieces of cardboard (four figures in a row). One box of Imex Alamo Defenders gave me 50 nice Texans, including New Orleans Grays, and figures for Crockett, Bowie, and Travis. These are nice figures, and I highly recommend them. The Texan's artillery came from two boxes of IMEX Union and Confederate Artillery. This will give you twelve cannons. I used figures from the Alamo Defenders set as gunners (one per cannon). The Texans were mounted individually. Here are some paper soldiers you can print and use: alamofigs.PDF. 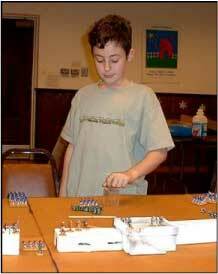 Building the Alamo: Following my keep it simple philosophy I made the walls out of empty aluminum foil boxes. These were spray painted white, and some textured paint was used to improve the look. The church was a cardboard box that was given the same spray paint treatment. The Alamo measured about 36" x 24". I made a log palisade and some assault ladders out of paper. The table was 7.5' x 5', which is a bit too small. Only the front of some Mexican columns could fit on the table. The remaining figures remained off board until the columns moved forward. 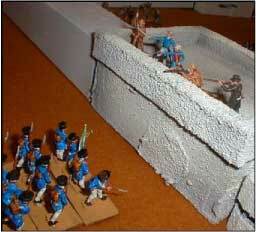 Deployment: All the Alamo defenders should be deployed on the walls. One figure is needed to crew each cannon. After the Texans have been placed the Mexicans should plan the attack. Their force of 58 bases should be divided into 6 assault columns. There must be one command base per column, and each column must include at least six bases. Five of the assault columns should be placed 18" from the walls of the Alamo, facing any part of the Alamo that the Mexican commander chooses. The sixth column will be the reserve. It should be kept off table, but the Mexican commander must secretly record where it will enter the table. Santa Anna starts anywhere at least 18" from the Alamo. Objective: The Mexicans must eliminate all the defenders in order to win a victory. Defenders may not leave the Alamo. Preliminary Bombardment: The Mexicans have three batteries for the bombardment. These don't have to be represented by models on the board. The Texans have twelve cannons for counter battery fire. These must be placed on the walls, and may not be moved from their starting locations. There will be 5 rounds (days) of bombardment. Each round the Mexicans decide which wall their cannons will be facing. They may relocate their guns every day. Roll 1D6 for each battery. A hit is scored if the battery rolls a 6. Each hit either creates a breach or destroys a Texan cannon, the Mexicans get to choose which. Remove any cannons that are destroyed. If a breach is created you can mark this by putting a small pile of gravel at the correct location. Each breach is the width of one Mexican stand of infantry. After the Mexican batteries fire the Texans can reply with any cannons that are facing the Mexican batteries. Roll 1D6 for each Texan gun. If a 6 is rolled then one Mexican battery is eliminated. Continue the duel with the surviving guns until five rounds have been completed. Texans Fire : The range for small arms fire is 7". Each Texan figure may shoot if there are enemy bases in range, and the figure is not operating a cannon Texans eliminate one Mexican base if they roll a 6 on 1D6. It takes one Texan figure to fire a cannon. Cannons have unlimited range. Cannons on the corner of a wall have an arc of fire of 270 degrees; a cannon off the corner has an arc of fire of 180 degrees. Cannons may not be moved, and may not fire into the Alamo. Cannons hit if they roll a 6 on 1D6. Each hit eliminates one Mexican base. If a Mexican column has not reached the wall and it loses one or more bases to Texan fire then you must check to see if the command base was a casualty. Roll 1D6 for each base lost this turn. If you roll a 6 then the command base is removed instead of one of the regular bases. There is no need to check for this after the column reaches the wall because the command base functions as a normal stand after reaching the wall. Texans Move : Each figure may move up to 6". Cannons may not be moved. 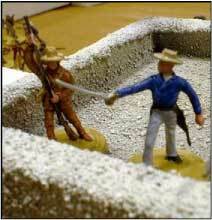 Resolve Melees: A melee is fought when a Mexican column is in contact with one or two Texans (only two Texans can attack a Mexican base). The Mexican column rolls 4 dice, and eliminates a Texan base on rolls of 4 - 6. Roll one die for each Texan base, and they need a 6 to eliminate the Mexican base..
Mexican Morale: Mexican columns that have not reached the wall must check morale every turn. Once the column reaches the wall it no longer checks morale. There are three morale states: Advancing (move 6" forward), Halted (stand in place), and Retreating (move 6" away from the wall). Turning the lead base around to face the rear marks a halted column. A retreating column has all of its base turned to the rear. Each turn roll 2D6 for each column. If the modified roll is 5 or more, it improves one morale level. If it's modified roll is 4 or less it goes down one level. Mexican Move: Columns that have not reached the wall move according to their morale level. 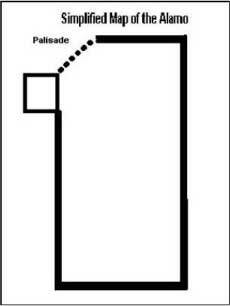 Once a column reaches a wall it may move one base to the left and right of the lead base each turn. Bases that start a turn next to a wall may attempt to scale the wall, or cross a breach. Once a base has made it onto the walls or crossed a breach it may move 6" per turn on its own. Scaling the Walls: A base that has enemy figures on the wall in front of it may climb the walls by rolling a 4-6 on 1D6. If successful the base is placed on the wall and will fight a melee with the enemy bases in its path. If it fails it must stand in place until next turn. If no enemy figures are on the wall then the Mexican base climbs successfully on a roll of 2-6. Crossing a Breach or palisade: If the breach is defended the Mexicans may automatically send one base per turn through it to melee with the defenders. If the breach is undefended then two bases may move 6" through the breach each turn. The palisade on the South wall is treated as a breach. Davy Crockett: Crockett hits with his rifle on a roll of 3-6. He kills a stand in melee on a roll of 5-6. Col. Travis: Travis hits with a roll of 5-6 with his rifle, and in melee. Jim Bowie: Bowie shoots successfully with a roll of 5-6, and hits in melee on a roll of 4-6. Because he is ill he may not move from his starting position. Dickinson: He is in charge of the artillery. The gun he is operating hits on a 5-6, and he hits on a 5-6 in melee. Santa Anna & Mexican Reserves: Santa Anna is a special figure for the Mexicans. He may move 24". He may not enter the Alamo, and is immune to Texan fire. He may help rally one Mexican column each turn by moving next to it. He adds +2 to its morale check. Santa Anna can order the Mexican reserve column to attack during any Mexican movement turn, but it must attack from the direction determined before the battle. The reserve column starts 18" from the Alamo with a morale of "Advancing," and may move 6" forward on the turn it is deployed. Acknowledgements: The rules for this battle are adapted from "Remember the Alamo!" by George Knapp, which appeared in MWAN 100. I found the article while browsing on Magweb. The original rules are excellent. For the most part the changes I have made are to simplify the game so that they will work well with my students aged 10-13. The battle can be completed in less than two hours. The Mexicans will suffer a much higher casualty rate than they did historically, but the game moves quickly and is fun. I urge you to check out Mr. Knapp's original rules if you are looking for a more detailed battle.